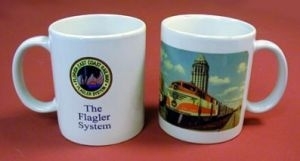 The Florida East Coast was founded by Henry Flagler. Rails ran all the way to Key West, was known as the Railroad to the Sea. 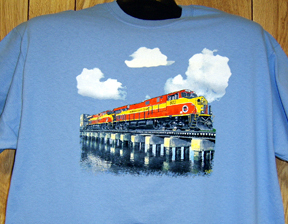 NEW TEE DESIGN of the Florida East Coast Railroads newest widebody diesel. So authentic you just might feel the vibrations. Mug features streamlined E-unit diesel of the Florida East Coast waiting for orders to leave Miami Florida. Mug features newest widebody diesel on the Florida East Coast Railroad... the GE-ES44c4 Tier 3-Compliant... you might just feel the power of its vibration. Mug features a new SD70-2 widebody diesel of the Florida East Coast. Photo courtesy Casey Thomason. 6 inch x 6 inch square tin Florida Keys logo sign of the Florida East Coast Railroad. 6 inch x 6 inch square tin latest logo sign of the Florida East Coast Railroad. 6 inch x 6 inch square tin logo sign of a very rare logo used by the Florida East Coast Railroad just after it had completed its Over Sea Extension to Key West Florida. 6 inch x 6 inch square tin Sunset logo sign of the Florida East Coast Railroad. 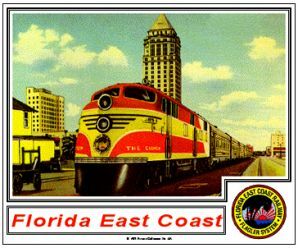 Florida East Coast pad features streamlined E-passenger diesel waiting for marching orders at the Miami station. 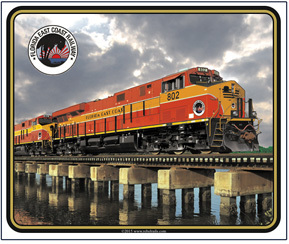 Mouse pads featuring the Florida East Coasts newest widebody diesels with No. 802 in the lead. 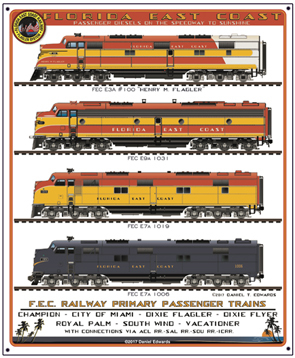 Unique sign featuring passenger cab unit diesels used by the Florida East Coast Railroad throughout the years. 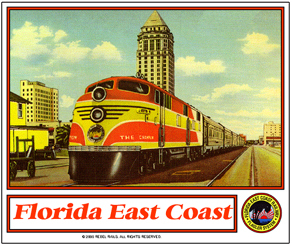 Tin sign featuring E-passenger diesel flagship passenger train stopped at the Miami Florida station.